French dramatist and performance artist Jonathan Capdevielle’s presents an unconventional self-portrait. With a cappella renditions of Madonna songs at its core, Adishatz/Adieu is a confessional documentary that shifts between real life and fantasy. Capdevielle plays different personas that explore his own roots and family background, his obsessions, transgenderism and nostalgia, and how the trashiest and most banal of pop music can reveal deep emotional truths. This genre-crossing, experimental drama is a visceral, poignant, and at times uncomfortable, experience. 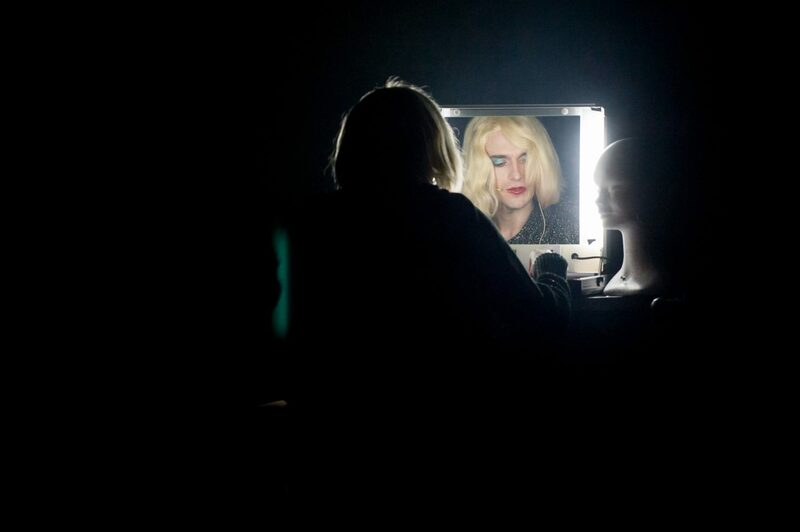 Capdevielle takes us on an intimate journey reliving traumatic and awkward incidents from his youth, conducting multi-voiced dialogues, imitating Madonna and other 1980s pop singers, dressing in drag, having a conversation with his dying sister, and singing along with a male choir. Violence and death are never far away in this convoluted yet engrossing self-portrait. Oslo audiences know Jonathan Capdevielle as the acclaimed performer in various Gisèle Vienne works. Since 2010, he has also created a very singular body of work and directed six pieces, both as a soloist and collaborator. In this directorial debut, he is the dancer, singer, ventriloquist, virtuoso actor, and unparalleled manipulator of objects; the aptly named “human jukebox” who leaves a lasting impression. Resolutely autobiographical, his work for theatre rummages through the narrow confines of the family unit and questions social determinism. l’accueil-studio (FR), BIT Teatergarasjen, Bergen (NO). Støttet av / With the support of: Centre national de la Danse (FR).